Klaasvoogds Opstal 130m2 is well equipped for long stays.It is ideally suited for either two, three or four people. The Opstal lie in the beautiful Klaasvoogds valley, at the foot of the Langeberg Mountains and has lovely views of vineyards, mountains and orchards. It is situated on a working wine farm. Free Wifi is available up to 1 gigbyte a day. We regret we cannot accommodate children under the age of 10, unless a refundable cash deposit of R2000 is paid on arrival. The solar-powered heritage cottage was built in 1894 and was the original homestead on the farm. We have recently renovated the derelict building, keeping the vernacular style and the charming old beams but adding contemporary features such as large sash windows and wooden glass-paned doors which bring in the light and beautiful views. It has wooden floors, hand-made French shutters, beautifully crafted wooden furniture and oil paintings. It has two bedrooms, the main bedroom has a queen sized bed and the original ball and claw bath with a separate toilet. The second bedroom has two single beds with a big en-suite shower and separate toilet, both with beautiful views of mountains and vineyards. The lounge/dining room/ kitchen is open plan with a wood burning stove. The cottage has a big garden with a patio and veranda with wrap around views of moutains and vineyards. It is well-equipped for long stays. We have good kitchen equipment, a fireplace, two gas heaters, two fans, a washing machine, a microwave, satellite TV, CD player and a kettle barbecue. Service included: Towels will be changed every three days, bed linen and cleaning will be done once a week. Enjoy lovely views of the mountains, vineyards and orchards from every room. On chilly nights settle in with a book in front of a roaring fire. Picnic and walk/cycle along picturesque country roads. As the day cools relax on the porch and watch the fiery sunset give way to a night sky sparkling with stars. Food and Wine: For really fine dining, walk to BBC featured Fraai Uitzicht 1798 (literally 900 metres away) and enjoy a glorious setting and food to make you swoon. For the lazy it’s a three minute car ride. Twenty minutes away, in Robertson, sample gorgeous food at the exclusive Small Hotel. Other good restaurants in the area include Mo and Rose, Lady Grey, The Barn, Simply Delicious and Tebaldis. We moved to farm in 2016 and now run the cottages personally. We hope to expand the accommodation, make wine, establish organic vegetable gardens and orchards and live off the land as far as possible. Both Charles and Jane are wine drinkers of note. Charles is a garagiste moonlighting as a quantity surveyor and Jane is a hedonist who dabbled in the media world for twenty years. What totally captivated us was the beautiful setting, the mountains, crystal clear mountain water supplying us, the vineyards and orchards. We love the fact that it is so rural with tractors and small trailers heaped high with fruit that come chugging past taking us back to the sixties and yet we also have fine restaurants. We feel safe here and can walk anytime during the day or night and we sleep on balmy summer nights on the veranda. Staying in luxurious accommodation in a spectacularly beautiful rural setting with fine dining restaurants and wine cellars on our doorstep. The luxurious bathroom and shower have views of the vineyards and 100% cotton percale towels and facecloths. The spacious living room is part of the open plan kitchen/ dining room area. The dining area is part of the open plan kitchen and lounge area. There is a large pretty garden with views of views of moutains, vineyards and orchards. The veranda, which leads on to the garden, is spacious with comfortable outdoor furniture and beautiful views of mountains, vineyards and orchards. We are two “early retirees” escaping winter in Belgium. The Opstal was our home during 10 weeks. The house is in a quiet location but not remote, and safe. In the distance you can see the neighbours. Some kilometres away, in Robertson, you will find everything you need. It is located between the vineyards and olive trees. Privacy is guaranteed. The hosts, Jane and Charles, keep their distance but if a problem occurs, they are there immediately to solve it for you. We, however, preferred the occasional contact, to get to know them. After 10 weeks, it feels like a genuine friendship. The Opstal is spacious, light, airy and cosy. Even on hot days the cottage can be aired naturally, keeping it comfortably cool. It is decorated tastefully and with style, preserving the original elements like the heavy beams supporting the ceiling, and antique elements have been added. All mod cons are there, into the smallest details. Solar energy provides hot water and WIFI. There is an ensuite bathroom with a bath and a walk-in shower. In the morning, you wake up to the sound of wild guinea-fowls, in a comfortable bed. The ground plan of the cottage is roughly a square. Each side has a terrace, different in size. The largest one, directed SW, gives you the view to a different sunset each evening. At any given moment, there is the option of the warmth of the sun or the cool shade on a terrace or under a tree. Contrary to Cape Town, here there is no shortage of potable water, which comes straight from a well high up in the mountains, and has a strong throughput. It is drinkable and tasty! Endless showers, pure luxury in 2018! Klaasvoogds is situated roughly on the crossing of Route 62 and the Gardenroute, at the end of the wineroute and 100 km away from Cape Algulhas, the most southern point of Africa! We wish you a wonderful stay at The Opstal (or The Cottage). As for us, we are definitely coming back! Very nice and quiet place.If you are not into parties and want to relax you are at the right place.Very nice and helpful owners with two nice dogs living nearby. Don`t miss to taste the the Kranskop wines in short walking distance. Thank you Ralf and Gaby it was a big pleasure hosting you and a special thanks for leaving the cottage immaculate. We are looking forward to your next, is it 4th or 5th visit ? A gem away from home! What a fabulous Cottage, we stayed for a week in January 2017 and had a delightful stay. Jayne and Charles made our stay even more enjoyable, they are helpful and friendly and know South Africa very well. The cottage is spacious and has fantastic natural light. Great for reading these books you have not read! Don't go anywhere else in this area until you have visited Klaasvoogds. Excellent resteraunts and great places to visit within an easy driving distance. Highly recommended by expereinced travellers. The cottage is in the countryside 10 km outside of Robertson. The space has more windows than you can imagine, which really brings the outside in. We especially enjoyed the quiet mornings with plenty on sunshine. Classic cottage, well appointed, and it was a pleasure to visit. It gave us a glimpse of rural South Africa. The owner was very accommodating to our needs. The cottage is beautifully furnished with antiques and plenty of comfortable chairs and sofas, and large doors and windows looking out onto the lovely views of mountains and vineyards. It is located next to a road but there is almost no traffic so it is very quiet and peaceful; it is close to restaurants, wineries and olive oil farms for tastings as well as a lavender farm where you can buy handmade lotions and potions. Generally much quieter and far less touristy than Stellenbosch. Highly recommended! thank you so much for the great time we had in the opstal cottage! This year was the second time we spent our holidays in the Klaasvoogds cottages and we can't wait to come back next year again! The cottages are the perfect place for people who enjoy privacy, peace and beautiful nature! Both cottages have a very nice and cosy interiour and all rooms have big windows and doors to the garden. It feels a bit like beeing outside even when you are inside. And we love the cool bathtub with view to the wineyards! For those who want to go out there are several restaurants and wineries near the cottages. But of course it is just great to hang around on one of the terraces with a book and listen to the birds. 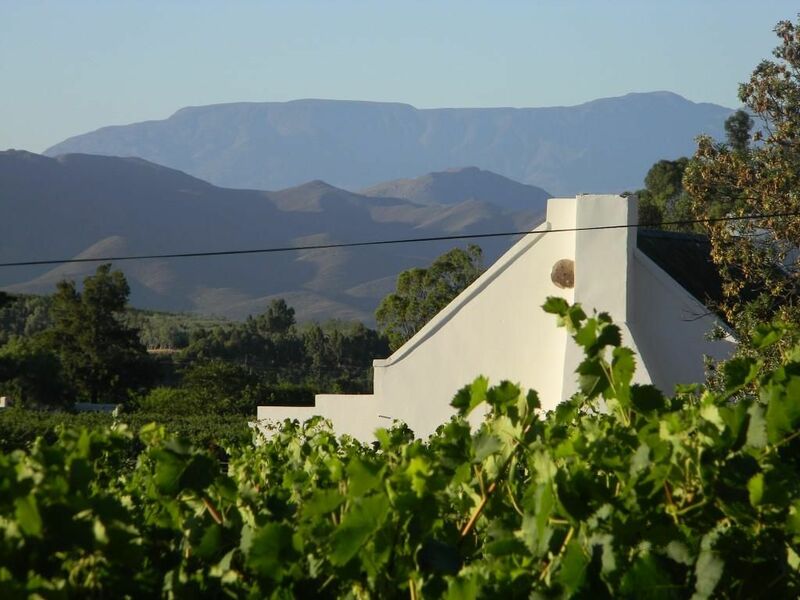 Klaasvoogds Opstal is situated on a working farm in the breathtakingly beautiful Klaasvoogds Valley between the charming, heritage-rich towns of Montagu and Robertson in the wine lands of the Western Cape. It is surrounded by sprawling vineyards and orchards and the Langeberg and Riviersonderend Mountains. They are centrally located in the Robertston wine valley on Route 62 within easy reach of many places of interest. It is a lovely 2 hour scenic drive from Cape Town. The area has many well-known and highly regarded wine farms. Golf: Robertson Golf Course : An 18 hole course with breathtaking views. Rates and reservations Check in time: 14h00 Check out time: 11h00 We regret that currently we cannot accept credit cards The tariffs include a basket of wood, a bathroom kit comprising shampoo, conditioner, body lotion and shower get, a day’s supply of coffee, tea, milk and sugar, use of two cotton bath robes and slippers. To secure a booking we require 50% of the total accommodation costs.